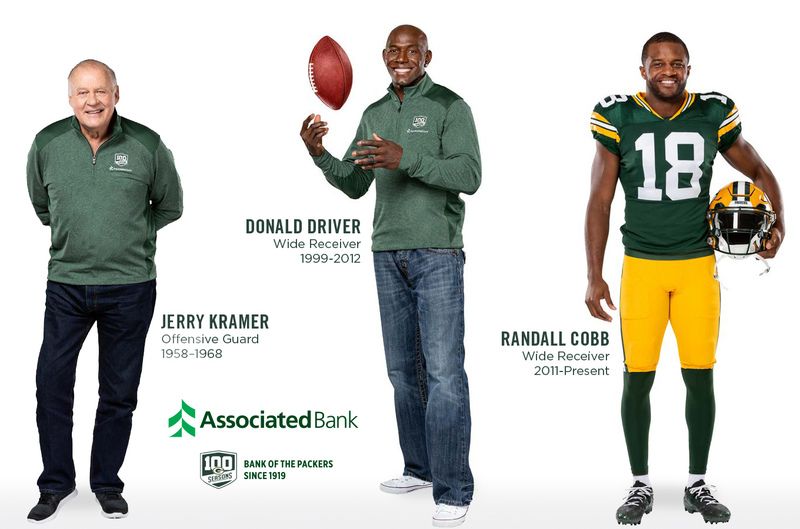 Donald Driver, Jerry Kramer and Randall Cobb will partner with Associated Bank in celebration of 100 seasons with the Packers. GREEN BAY, Wis. – June 4, 2018 – Associated Bank (NYSE: ASB) announced today a new partnership with Green Bay Packers alumni Donald Driver and Jerry Kramer, in celebration of 100 seasons with the Packers, and an extended partnership with Green Bay Packers receiver Randall Cobb. Driver and Kramer, Packers legends and game champions, are well respected in the Green Bay community and across the nation. This announcement comes as the Packers and Associated Bank prepare to celebrate 100 years of football and partnership. The trio, spanning over three generations of Packers history, will be featured this season in the bank’s fan and customer engagement campaign with a wide range of marketing activities and community initiatives. All three are Associated Bank customers. Associated, the largest bank headquartered in Wisconsin, has been the Bank of the Packers Since Day One and proudly celebrates 100 years with the team and community. A high-profile marketing campaign will soon invite fans to “Join the Legacy” and experience the better side of banking.